Welcome to a new school year! We are excited to have new faces join our AVID family as well as welcome back family members from last year. We hope you had a restful Summer break and are excited for this new school year. We have a lot of fun things planned this year and are anxious to meet all of you and begin our journey together as we prepare you for your journey towards your eventual goal... college! 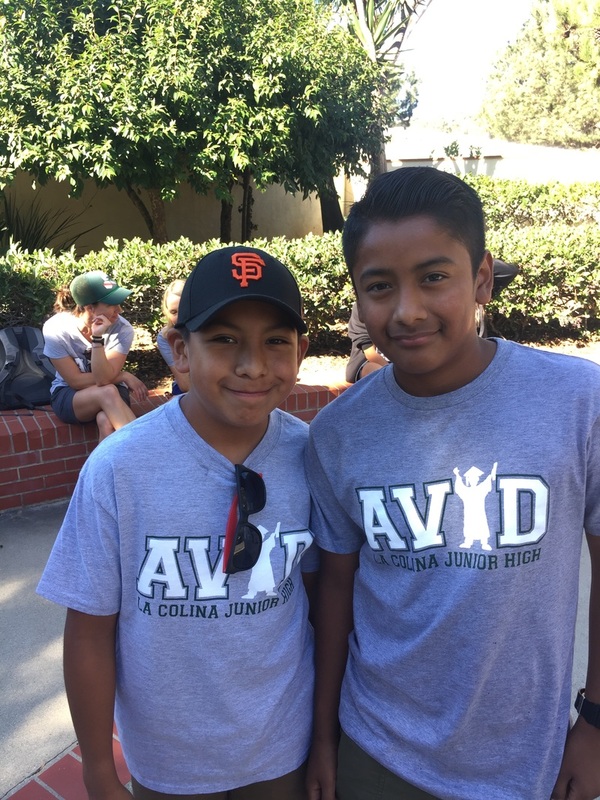 Apply to the La Colina AVID Program by clicking this link. AVID (Advancement Via Individual Determination) is a sixth through twelfth grade system to prepare students in the academic middle for four-year college eligibility and success. It has a proven record in bringing out the best in students and closing the achievement gap. 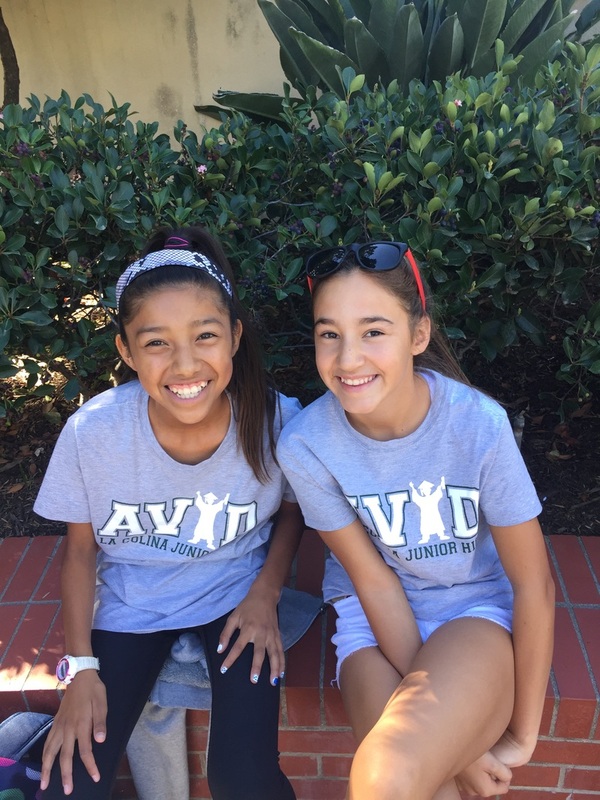 The goal of AVID is to provide students with high expectations, encouragement, day-to-day help through the AVID elective class, and a vision of college as an attainable goal. AVID is a program designed to give the necessary support to students, particularly those in the academic middle, so that they can attend college and achieve their fullest potential. It also serves to level the playing field for minority and low-income students, as well as students who may be the first in their families to potentially attend college. The AVID program serves to support its students by teaching and reinforcing study and organizational skills (Cornell note-taking, 3-ring binder with labeled dividers, etc. ), encouraging students to take more rigorous and challenging classes, providing skills necessary to succeed in college (public speaking, team building skills, interaction with professors, etc. ), and ultimately preparing them for success at a four-year university/college. AVID students have skilled tutors, often college students studying to be teachers or studying one of the major subject areas, to help them with their studies. Students are taken on field trips to local colleges and universities throughout the program to familiarize them with some options. The projects planned are rich in content, cooperative learning, and applications that simulate "the real world" after high school. AVID is not a "remedial education" program; instead it is a program designed to provide whatever support may be lacking for at-risk students who possess academic potential, but who may not be working to the best of their abilities. AVID targets students in the academic middle who have the desire to go to college and the willingness to work hard. These are students who are capable of completing rigorous curriculum but may need extra support to academically grow to their potential. Typically, AVID students will be the first in their families to attend college. AVID makes sure that each student is taking challenging courses and makes sure they are on track to attend college. The AVID elective class is held within the regular school day and provides support and academic monitoring and tutoring. Not only are students enrolled in the school's toughest classes, they are also enrolled in the AVID elective class. For one period a day, they learn organizational and study skills, work on critical thinking and asking challenging questions, get academic help from peers and college tutors, and participate in enrichment and motivational activities that show students that college can be attainable. The AVID curriculum, based on rigorous standards, was developed by teachers in collaboration with college professors. It is driven by the WICR method, which stands for writing, inquiry, collaboration, and reading. AVID curriculum is used in the AVID elective classes and also in content-area classes as well. The AVID elective teachers (Mrs. Ulvaeus, Mrs. Lowi, and Mr. Marquez) are committed to serving the needs of the AVID students. They are here to help the AVID kids be successful in school and achieve their academic best. They also serve as a mentor and counselor to the students fostering a family atmosphere. The AVID coordinator (Mr. Marquez) also works with content area teachers, counselors, and the administration to implement AVID methodologies school-wide, place students in rigorous classes, and work with counselors to guide students through the process of transitioning into high school. Tutors are essential to the success of the AVID elective class, where they facilitate student access to challenging curriculum. The AVID tutors are either high school or college students who receive formal training in becoming an AVID tutor. They serve as role models for the AVID students and establish a great learning environment in small tutorial groups. AVID students who continue their education in college often return to the program as tutors. This year most of our tutors are actually in the Teacher Education Program at UCSB.